Katie is volunteer co-ordinator for our team of volunteers going out to Thailand in July this summer, she volunteered with VESL in 2012 for six weeks. Check out her advice below! My name is Katie and I am a team leader for July 2014. I studied Human resource management and law at Keele University, but I now work as a one to one TA. I previously went to Thailand in 2012 and hds the most amazing and memorable time over there. 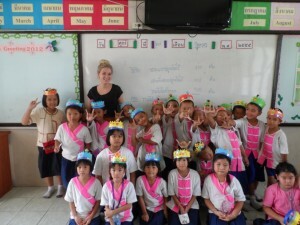 The children were a pleasure to teach and the people were so kind and friendly towards you. I love to travel and go on family holidays, exploring the culture and different ways people live in different parts of the world. Fundraising ideas for this year include a bag pack, cakes sales, coffee morning , holding a non uniform days within my old schools and possibly a spinathon with a group of Keele volunteers. I am extremely excited to be a team leader in Thailand this summer. A bum bag – to keep all your valuables with you at all times. A laptop – they are not a necessary item you will need overseas – there are plenty of internet cafes if you want to communicate back home. Prepare yourself and you will have the most enjoyable and rewarding experience over in Thailand. Going back into Thai schools and making a difference towards the progression and learning of English to the children and the teachers. My first lesson was called introduce yourself. I got the children to listen and repeat “my name is …. I am _years old” We then spelt it out on the board, as a small warm up activity, then I gave them all a strip of coloured paper and some crayons. Then got to make a name card saying my name is…. I am _ years old. 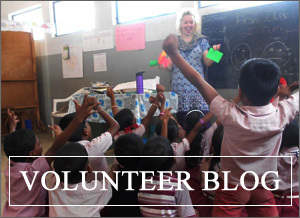 What was your most memorable moment as a VESL volunteer? Every morning when we approached the school, all the children would come running to the car bow down and say “good morning teacher” it was a perfect start to every teaching day. The traditional and famous pad thai. Do you have any tips for travelling at weekends? DO IT !!! Chaing Mai is extremely close, only about a hour or so on a coach and there are so many things to do there, make the most of exploring Thailand when you are there. My biggest challenge was probably the language barrier at first, but then it’s such an easy language to pick up – communication became pretty easy at the end.